Atoms are the smallest particle of an element that retains its identity in a chemical reaction. 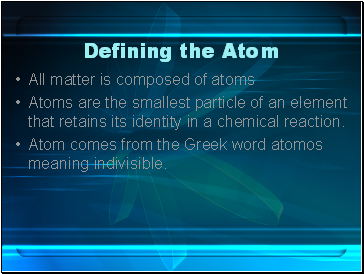 Atom comes from the Greek word atomos meaning indivisible. 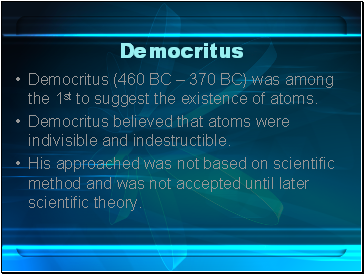 Democritus (460 BC – 370 BC) was among the 1st to suggest the existence of atoms. Democritus believed that atoms were indivisible and indestructible. His approached was not based on scientific method and was not accepted until later scientific theory. 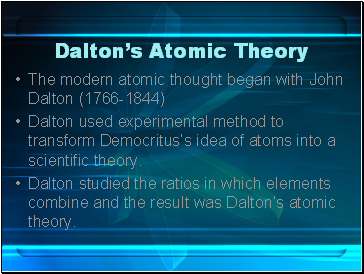 Dalton used experimental method to transform Democritus’s idea of atoms into a scientific theory. 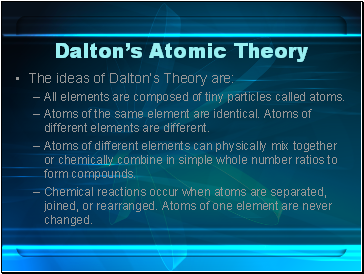 Dalton studied the ratios in which elements combine and the result was Dalton’s atomic theory. All elements are composed of tiny particles called atoms. Atoms of the same element are identical. Atoms of different elements are different. Atoms of different elements can physically mix together or chemically combine in simple whole number ratios to form compounds. Chemical reactions occur when atoms are separated, joined, or rearranged. Atoms of one element are never changed. 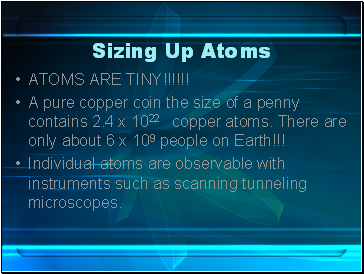 A pure copper coin the size of a penny contains 2.4 x 1022 copper atoms. There are only about 6 x 109 people on Earth!!! Individual atoms are observable with instruments such as scanning tunneling microscopes. Atoms are now know to be broken down into smaller, more fundamental particles called subatomic particles. 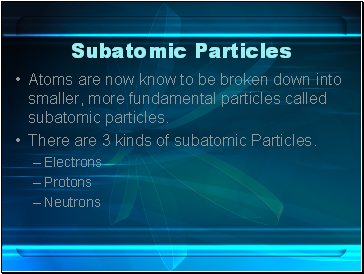 There are 3 kinds of subatomic Particles. Discovered in 1897 by J.J. Thomson (1856-1940) an English physicist. They are negatively charged subatomic particles. 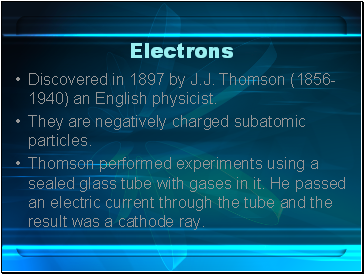 Thomson performed experiments using a sealed glass tube with gases in it. He passed an electric current through the tube and the result was a cathode ray. 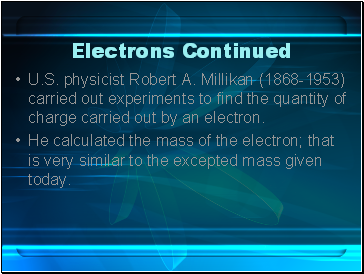 U.S. physicist Robert A. Millikan (1868-1953) carried out experiments to find the quantity of charge carried out by an electron.